Solo: A Star Wars Story is a 2018 science fiction and fantasy film from director Ron Howard. It is the tenth live-action film in the Star Wars film franchise, and it is the second anthology or “stand-alone” film (meaning that it is not part of the “Skywalkers saga”), following 2016's Rogue One: A Star Wars Story. 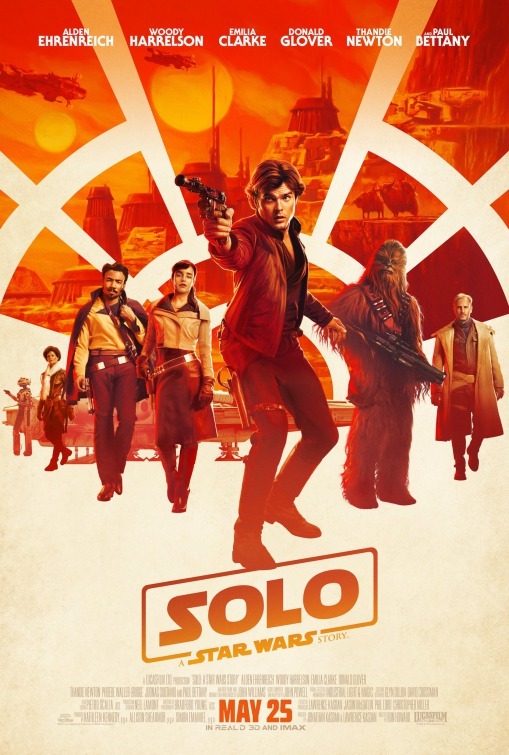 The film focuses on a younger version of classic Star Wars character, Han Solo, and tells the story of how he got his start as a space pirate and smuggler. Solo: A Star Wars Story opens on the shipbuilding world of Corellia. There we meet a young "scrumrat" and aspiring pilot named Han (Alden Ehrenreich) and his lover, Qi'ra (Emilia Clarke), who both long to escape the clutches of the local criminal gangs and to leave the planet for new lives. However, only Han manages to escape, and he joins the Imperial Navy of the Galactic Empire as a flight cadet. Three years later, Han is serving as an infantryman during a battle on the planet Mimban. There, he encounters a gang of criminals posing as Imperial officers, led by Tobias Beckett (Woody Harrelson). Han and his new friend, Chewbacca (Joonas Suotamo), a Wookie with whom he just became acquainted, bribe their way onto Beckett's crew. Han and Chewbacca's first heist with Beckett, however, leads him into dangerous places. Han meets a murderous crime lord, Dryden Vos (Paul Bettany); discovers a smooth-talking and rising young smuggler, Lando Calrissian (Donald Glover); enters a new heist that could make or break his future; and reunites with a figure from his past. Much about Solo: A Star Wars Story feels contrived and shoved in, as if the filmmakers and storytellers are trying to reveal the origins of everything Star Wars fans know about the Han Solo. From his name to his personality, very little if anything is not covered. Still, one can make an argument that much about the original Star Wars (1977) is contrived. What is important is that Solo: A Star Wars Story feels like classic era Star Wars films (1977 to 1983). Like the other anthology film, Rogue One, Solo: A Star Wars Story is infused with the spirit of adventure of the original films. Solo is partly a Western, like the original Stars Wars. Solo is a far-flung space opera and interstellar fantasy like the original trilogy. Part of the reason that Solo feels so classic Star Wars is that one of the film's two screenwriters, Lawrence Kasdan, wrote two of the original trilogy films, and his son, Jonathan, is the co-screenwriter here. Solo director Ron Howard should have directed a Star Wars film a long time ago, as far as I am concerned. He has previously worked with Star Wars creator, George Lucas, on the fantasy film, Willow (1988). So Howard was fated for a Star Wars film, and I am glad it is Solo. As for the characters, Alden Ehrenreich is good as young Han Solo. Ehrenreich tries to capture the spirit of the performance of the original Han Solo actor, Harrison Ford, but Ehrenreich plays young Han, not as a fully grown man, but as someone still evolving. Donald Glover is excellent, superb, and great as young Lando Calrissian (who was originally played by Billy Dee Williams). Solo is not a big enough movie for two personalities like young Han and young Lando, so Lando needs his own movie. And new Chewbacca actor, Joonas Suotama, is good, but it is hard to mess up playing Chewbacca. If this review makes it seem that I am much more pleased with Solo: A Star Wars Story than I am about the most recent other Star Wars film, Star Wars: The Last Jedi, I unequivocally am. Solo is a real movie all on its own – beginning, middle, and end. While it may not add much to the fictional mythology of the Star Wars franchise, Solo: A Star Wars Story gets it right by looking, feeling, and acting like classic Star Wars.